Tim has been smokin’ BBQ for a long time. All our friends and family have enjoyed it and kept telling us we needed to do something with it. We were invited to a local bbq contest with no expectations. Low and behold we won some prizes. He placed 3rd for his pulled pork and we won People’s Choice all around. We thought that was a great finish for our first time ever doing anything like this. Well that sparked the dream. We have always wanted to do this and now we are. We have put our hope and trust in God’s hands and He has opened so many doors for us. We’ve won a few more awards since then and we look forward to winning more in the future. 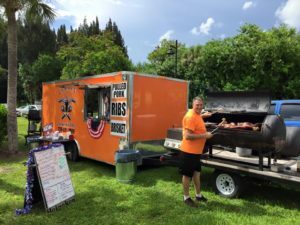 So keep an eye out for Currie’s Smokin’ Hot BBQ! We are a local catering company that will do any type of event large or small. 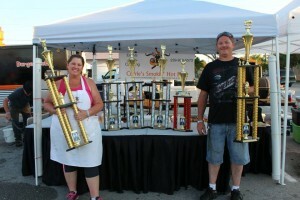 We specialize in award winning BBQ and homemade sauce and all types of sides. However, we do a whole lot more than bbq. We will cook up what ever you want us to. We’ve done weddings with guest counts as high as 500. We’ve done plated holiday dinners and family style banquets. We can handle your backyard summer BBQ or your company picnic. We set up our trailer and sell food at fairs, craft shows, festivals, fund raisers or charity events. Our goal is to have a concession trailer by the end of 2015.
road in the late spring. We are loving it! Contact us for more information and stay tuned for updates on where we will be. as working for the Lord, not for people.